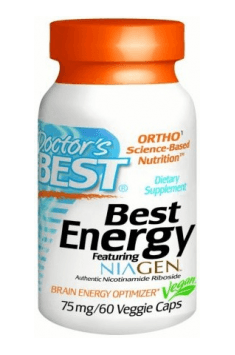 Doctor's Best Best Energy is a dietary supplement containing a unique formula NIAGEN, which provides nicotinamide riboside – a derivative of niacin (vitamin B3), which constitutes a precursor for the synthesis of nicotinamide adenine dinucleotide (NAD). The preparation increases efficiency of energy cells, helps to maintain vitality of the organism, improves efficiency of the nervous system and influences slowing down aging processes. Nicotinamide riboside is a form of vitamin B3, which is very important in the transformations of NAD+ - an organic compound which plays a key role in biochemical processes of the organism. NAD+ regulates energy metabolism, influences aging processes of cells and helps to maintain proper abilities of mitochondria. Nicotinamide riboside is NADH in a recued form and NAD+ in an oxidized form. It is a nucleotide, which plays a very important function in cellular respiration. NAD+ is a basic substrate in 3 reactions of Krebs cycle – reaction of oxidation of isocitrate to oxalosuccinate, decarboxylation of alpha-ketoglutaran to succinyl-CoA and oxidation of L-malate to oxaloacetate. Krebs cycle, which constitutes a final step of oxygen transformation in the organism, conditions proper energy efficiency of our cells. NAD+ is produced in the organism as a result of oxidation of the reduced form of NADH. In relation to this, providing its precursor from outside, we may support Krebs cycle, accelerating and facilitating its course. NAD+ helps to maintain the organism in the state of homeostasis, slows down degenerative processes and is conducive to better regeneration of damaged structures. This compound, due to its influence on energy metabolism and maintaining stability of mitochondrial membrane, positively influences ATP synthesis – the basic store and energy carrier in the organism. As a result of this, NAD+ is conducive to better abilities of the organism and facilitates repair processes. NAD+ also directly influences activation of sirtuin (protein SIRT1, SIRT2, SIRT2, SIRT7), which among others condition proper transcription and repair of DNA, are responsible for rebuilding the structure of chromatin, regulate inflammatory processes of the organism. Sir proteins (Silent information regulator) belong to NAD+-dependent deacylases, which catalyze reaction of deacetylation, consisting in nipping off the residue of acetic acid from protein substrates. This reaction is coupled with NAD+ hydrolysis, which is its key cofactor. The discoveries of recent years prove that overexpression of genes coding sirtuins contribute to slowing down aging processes and prolonging lives of many organisms. It was proven that sirtuins constitute an element of the apparatus of genetic control of aging, which is evolutionarily preserved and protected in unbeneficial environmental conditions in order to facilitate survival. Summing up, Doctor's Best Best Energy is a dietary supplement, which increases vital powers of the organism and helps to slow down aging processes. The preparation considerably contributes to better regeneration of the organism and improves its physical and psychological efficiency. Unfortunately, with age, gene expression is disorganized and the level of NAD+ is decreased, which influences, i.a. deterioration of metabolism, weaker regeneration, worse mood and drop of energy as well as developing various health problems. The preparation, thanks to its influence on energy metabolism and activation of longevity genes, may turn out to be a promising element in the therapy of many ailments related to old age. Take 2 capsules daily, after meals, or more, as recommended by a nutritionally-informed physician. In the light of research, the dose recommended by the producer - 150 mg (2 capsules) per day seems to be optimal and sufficient to notice surprising effects. It was proven that even one 100 mg capsule contributes to the increase of NAD+ even by 30%. The first signs of the effect of the preparation (well-being, more energy, improvement of cognitive functions and the quality of sleep, faster regeneration) are reported most often during 4-16 weeks from starting supplementation.